Clean chimneys are safer chimneys! NACS, many insurance companies and all fire brigades recommend sweeping at least once a year by a professional. Woodburning appliances require more frequent chimney sweeping, due to the extra carbon deposits given off during combustion. However, cleaning is not the only reason for an annual visit. Our service includes a visual inspection and any safety issues are brought to the attention of the customer and noted on the certificate. This and any advice, is of course, free. *For as little as £35, we can ensure your chimney is properly swept and safe to use. Please note: It is our policy not to remove live birds nests. We offer very competitive rates for flue lining with flexible stainless steel liners and rigid systems. Buying a stove on the internet brings substantial savings compared to buying from a stove shop. 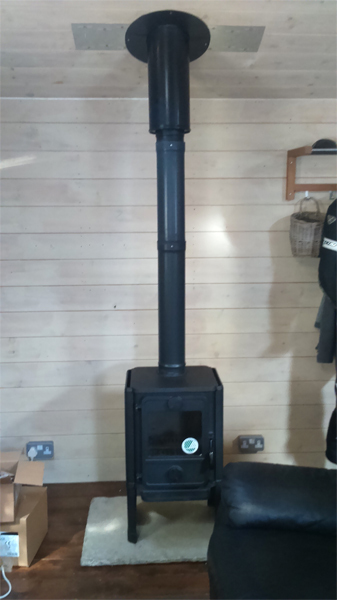 We are able to offer most makes and models of stoves from this site, at discounted internet prices, but wherever you obtain your stove, we can install it and line the chimney for you and supply the necessary certification. We are HETAS registered installers under the Government's Competent Persons Scheme, qualified to carry out this kind of work to building regulations and certificate it. We can supply most makes and models at massively discounted internet prices - just ask. Worn or cracked chimney flaunchings allow water to penetrate lower into the masonry joints. 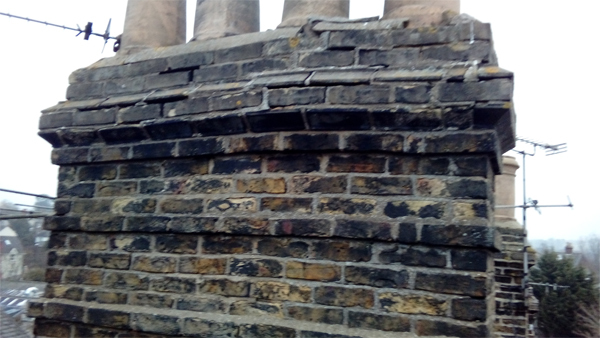 After several freeze/thaw cycles, these mortar joints fall out, causing substantial damage to the brickwork and potential roof damage from falling masonry. "A stitch in time" is a most apt expression with regard to stack repairs. 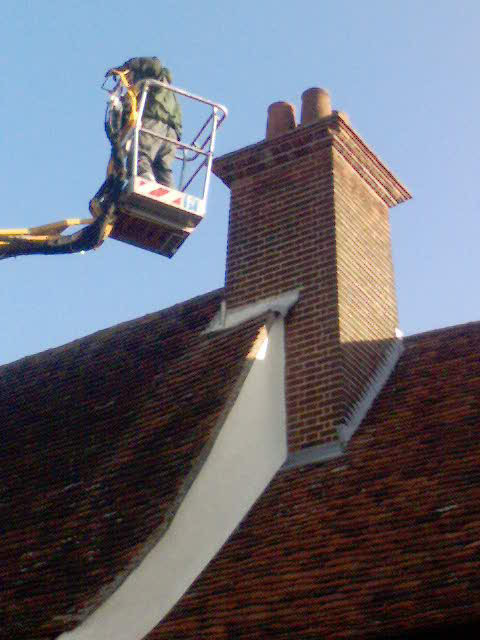 From minor cement repairs to complete rebuilds, we can access any chimney to re-point or re-lay brickwork, replace pots or flashings, cap off, vent or dismantle disused stacks. 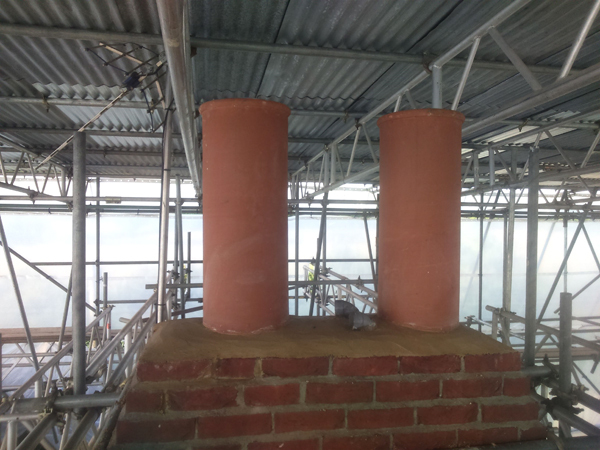 We repair and rebuild historic chimneys and fireplaces using traditional materials such as soft red bricks and lime putty. We consider it a mark of respect to our heritage to ensure that beautiful old chimneys are cared for in the correct manner. Unfortunately, many chimneys are damaged beyond repair by builders using modern Portland cement on old brickwork, which not only looks dreadful, but is also wrong from an engineering point of view. We can also source and fit reclaimed chimney pots to ensure the chimney remains in keeping with a period property. We supply and fit a wide range of terminals for different applications, including gas, oil and solid fuel terminals, anti-downdraught cowls, rotary cowls, H cowls, caps and more. Boiler flue, industrial chimney, duct cleaning and repair. We are pleased to quote for industrial, commercial, government and council contracts and are fully conversant in health and safety procedure, risk assessment, method statements, etc. Our clients include property management companies, local authorities and the Ministry of Defence. 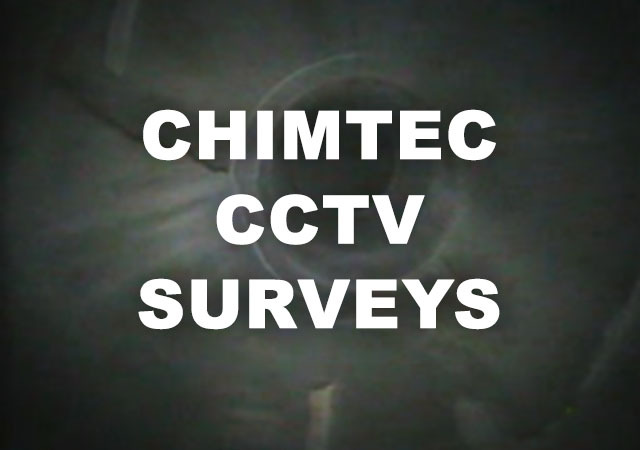 Some chimney problems can be difficult to see and identify, using the latest digital camera technology we can inspect the inside of any flue or chimney and if required and burn the video to disc, for you to view on your PC, laptop or DVD player in the format of your choice - DVD, MPG, AVI, etc. Old-fashioned VHS also available. Solving chimney problems often requires a great deal of knowledge and experience, there are many possible causes for issues such as downdraught, smoking back, flue damage, etc., and we can give expert advice and recommend remedial action. We also offer comprehensive surveys, written in plain English, for legal, insurance and surveying purposes, with flue integrity tests, updraught tests and expert evaluations. © 2019 Chimtec® Chimney Solutions | Contact | ?